Whenever friends learn that I live in a tiny studio apartment, they always ask how I can stand living with a cat, “Doesn’t he make it, well, stink?” I always explain that unless we’ve been gone an unusually long period of time, we don’t notice a litter box smell in our apartment. If we do, it’s a sign that we need to scoop, pronto! Even if your cat is as small as adoptable Zorro, you need to take proper care of the litter box. I might be lazy about putting away my own laundry or personal clutter, but I’m never lazy about Toby’s litter box! I used to be. When I first became Toby’s cat mom, I knew very little about cats and how to care for their litter boxes. I hadn’t grown up with one, but my roommate had so I followed her example. My roommate kept her cat’s covered litter box in a closed closet with a cat door. I thought the smell was inevitable. However, I soon got sick of the stink and developed a new routine. We air out Toby’s box. Because we couldn’t find a box with high enough sides to contain some of Toby’s less-endearing habits, our behaviorist suggested a covered box. I always take the lid completely off Toby’s box for a few minutes every day to ensure it airs out. I have a friend who opens her human bathroom window for a little bit every day, even the dead of winter, on the same principle. We wash the scooper. I know, it sounds like common sense, but I had a friend who only washed his scooper once a week. I cringed at the thought of the buildup on that scoop! We rinse ours after every use to make sure nothing is left to fester. We also wash the litter box. About once a week we dump the litter and completely wash the litter box before drying it and refilling with clean, fresh litter. We sprinkle. A box of baking soda sits with our bag of litter so that every time we scoop, we sprinkle. It’s the same idea behind sprinkling baking soda on carpets or keeping a bowl in your fridge. My grandma really was right that it absorbs almost any odor. I’ll admit, whenever friends are stopping by, we make an extra trip to check the litter box so it’s as fresh as possible. This wouldn’t help if we didn’t regularly clean Toby’s litter box the rest of the time. However, we credit it with why no one has ever asked about the scent of Toby after visiting — they know there’s no stink. 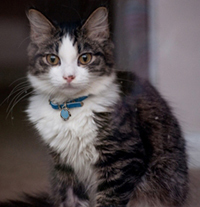 Read more Petfinder tips for controlling litter box odor. Then let us know, we promise we won’t judge, do your friends notice a litter smell in your home? Did you make the same mistakes I did? Arm & Hammer is offering $1.00 off the purchase of clumping cat litter to Petfinder readers for a limited time. Click here to see this and other special offers.